For comedian Sacha Baron Cohen, there are no taboo subjects, and his latest movie, “The Dictator,” is an all-out assault on Middle Eastern fascism, American politics and good taste. It’s also extremely funny. One has to admire Cohen’s willingness to attack any subject with abandon. It’s a tendency that leads to both side-splitting laughs and wince-inducing gross-outs, the kind that only appear when a performer is laying it all on the line. 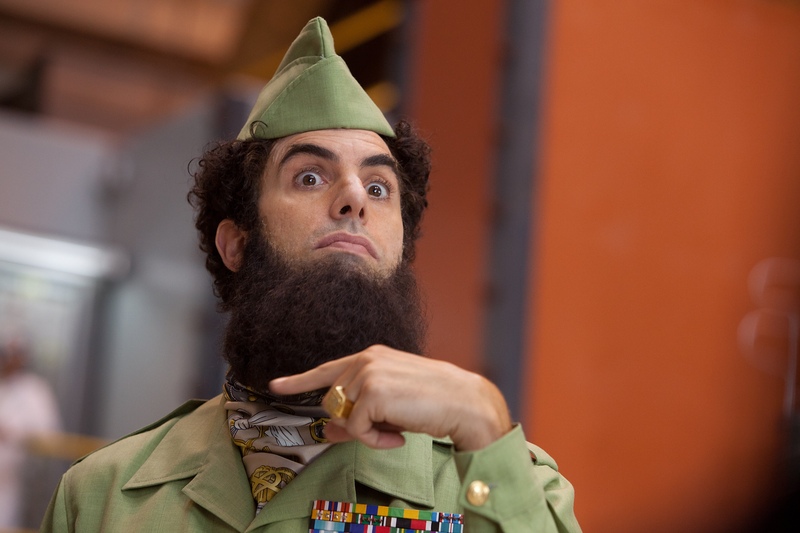 In “The Dictator,” Cohen plays Aladeen, the dimwitted ruler of an oil-rich North African country called Wadiya. Despite having little political savvy, Aladeen rules with gusto, ordering the execution of anyone who disagrees with him and flaunting his wealth and power at every opportunity. When Aladeen makes it known that Wadiya is on the verge of producing weapons-grade uranium, it creates an international crisis that brings him to United Nations headquarters. Before he can ignite what would surely be a bigger furor, Aladeen is kidnapped by an assassin and replaced by a look-alike. Although Aladeen escapes with his life, nobody believes he is the rightful ruler of Wadiya, so he spends the remainder of the film doing wildly inappropriate things and attempting to regain power. Longtime Cohen collaborator Larry Charles directed “The Dictator,” and the movie provides a steady stream of funny, and often outrageous, gags. The tone is consistent with what Cohen and Charles created in “Borat” and “Bruno,” so fans know what to expect. Cohen is the dominant figure in most of his films, but good background players make a world of difference, and “The Dictator” has a solid bunch. Sir Ben Kingsley is particularly entertaining as Tamir, the most trusted advisor to Aladeen. Anna Faris also turns in a noteworthy performance as a political activist who meets Aladeen after he’s been removed from power. “The Dictator” is an odd bird in that it plays with Middle Eastern stereotypes, yet doesn’t seem patently racist because Cohen is satirizing extremists rather than one particular ethnic group. He also points out that Western political culture has plenty of its own flaws. Regardless, some viewers are sure to be offended by the reckless, in-your-face humor that dominates every frame. Because neither Cohen nor Charles play it safe, their films walk a fine line between brilliant and abrasive. DVD and Blu-ray extras include deleted and extended scenes and a Larry King interview segment. The latest entry in the eco-friendly Disneynature documentary series considers a group of chimpanzees living in the depths of the African rainforest. Directed by veteran documentarians Alastair Fothergill and Mark Linfield, the movie captures astonishingly beautiful footage of the chimps as they work, play and even fight. As with all the Disneynature projects, the 78-minute feature has been edited down to focus on one story that will be easily digestible by children. In this case, the spotlight is on Oscar, a newly born chimp who must quickly adapt to the harsh ways of the jungle. In relating the plot, narrator Tim Allen has a tendency to anthropomorphize the animals, which has plusses and minuses. Obviously, ascribing human traits to the chimps allows youngsters to relate to the action on screen. On the other hand, more science-minded viewers may find themselves longing for a purely objective approach. In fact, “Chimpanzee” misses a lot of opportunities to inform its audience. The filmmakers regularly cut to stunning, time-lapse shots of the rain forest without any explanation of what’s being shown. Had Allen bolstered these visuals with a fact or two, the experience would have been much deeper and richer. Despite missed opportunities, it’s difficult to fault a movie that brings viewers so close to a world most will never be able to explore in person. It is particularly impressive when Fothergill and Linfield deliver close-ups of chimpanzee facial expressions. These wonderful, forest-dwelling creatures may not be human, but it’s easy to recognize pieces of us within them. DVD and Blu-ray extras include a making-of feature and several shorts about Disney’s global conservation efforts. Only a handful of foreign films gather the sort of attention that was lavished on “A Separation” early this year. The beautifully crafted Iranian drama was a smash hit with critics, and it won the Oscar, Golden Globe and Critics Choice Movie Award for best foreign language film. The story takes place in present-day Iran, and it centers on a middle-class family in crisis. Simin (Leila Hatami) wants to move to America with her husband, Nader (Peyman Moadi), and their 11-year-old daughter, Termeh (Sarina Farhadi). Nader refuses to go because he is concerned that his Alzheimer’s-stricken father cannot survive without them. At an impasse, the couple decide on a temporary separation. The stress that the family is facing comes to a head when Nader discovers that the young woman he hired to help with his father (Sareh Bayat) is being dishonest with him. The confrontation that follows has devastating consequences that threaten to change everyone’s lives forever. Written and directed by Asghar Farhadi, “A Separation” is a domestic drama of the first order. The acting is superb and the storytelling – although deeply steeped in Iranian culture – is universal. Anyone who has dealt with a family crisis should be able to put themselves in the characters’ places. “A Separation” is presented in Persian with English subtitles. DVD and Blu-ray extras include an audio commentary track by Farhadi. “Bernie”: Critically acclaimed dramedy based on the real-life story of Bernie Tiede, a Texas funeral director who murdered a wealthy widow, then took pains to convince everyone she was still alive. Jack Black stars as Tiede, and Shirley MacLaine portrays his victim. Directed by Richard Linklater. “Weekend”: Writer-director Andrew Haigh’s story of two men who hook up for what promises to be a one-night stand but end up in a much deeper relationship. Tom Cullen and Chris New star. Presented by the Criterion Collection. “Freelancers”: Police thriller about the son of a slain New York Police Department officer who falls in with a group of bad cops. Curtis “50 Cent” Jackson, Forest Whitaker and Robert De Niro star. Directed by Jessy Terrero. “Revenge” – The Complete First Season: First 22 episodes of the ABC series about a woman (Emily VanCamp) who moves to the Hamptons with the sole motive of exacting revenge on the people who ruined her family. Madeline Stowe and Gabriel Mann also star. “Mike & Molly” – The Complete Second Season: The second season of this popular relationship comedy centers on Mike’s (Billy Gardell) and Molly’s (Melissa McCarthy) impending wedding. “House, M.D.” – Season Eight: Final season of the long-running medical drama about an eccentric doctor (Hugh Laurie) who tackles the world’s most baffling cases. “The Closer” – The Complete Seventh and Final Season: The last few episodes of the popular drama starring Kyra Sedgwick as a hard-nosed Los Angeles Police Department deputy chief.